This pleasant day trip is an excellent opportunity to experience what it is like to paddle the exposed west coast without having to drive for hours and plan overnighters. You can explore an exposed a rocky coastline and windswept cliffs with a background of rain forest interspersed with dry hill tops and scrubby pines shaped by the wind. Like much of the west coast, you won’t find many places to land along here, but when you do it can be spectacular, just as it is on our destination beach near Cabin Point in East Sooke Regional Park. This trip is recommended for intermediate and experienced paddlers as you may experience strong currents as well as the potential for being exposed to high winds in the Juan de Fuca Strait. During the summer months westerly winds often build in strength during the course of the day. You can also encounter large swells rolling in from the open ocean. This combined with very limited options for landing require good trip planning and caution. See the trip planning portion of this blog. 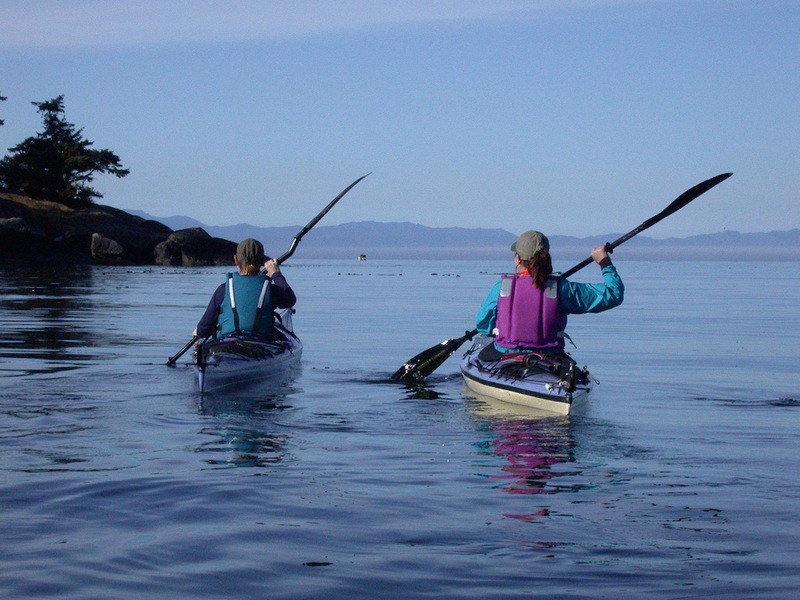 Your starting point for this trip is Whiffen Spit in Sooke, about a 1 hour drive from downtown Victoria. Whiffen Spit forms the outer boundary of Sooke Basin and is a naturally formed sandy spit of land extending out 1.1 kilometers into the mouth of the inlet. 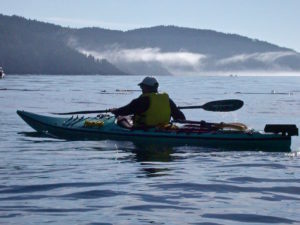 It protects the Sooke Basin from the open waters of the Juan de Fuca Strait and makes for an easy sheltered launch on the basin side of the spit. You can also launch on the Juan de Fuca side depending on conditions, but if there is any wind you may find waves breaking on this shore, making launching more of a challenge. 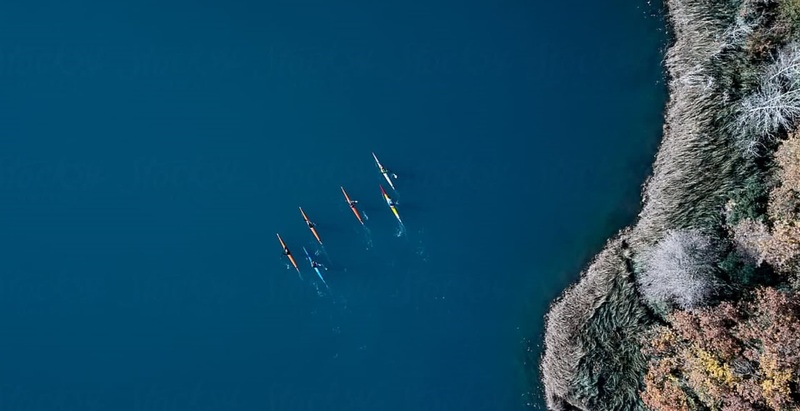 The paddle out along Whiffen Spit can be spectacular, particularly on a calm morning. The spit only rises 2 meters above sea level and is sparsely covered by vegetation including a few trees. 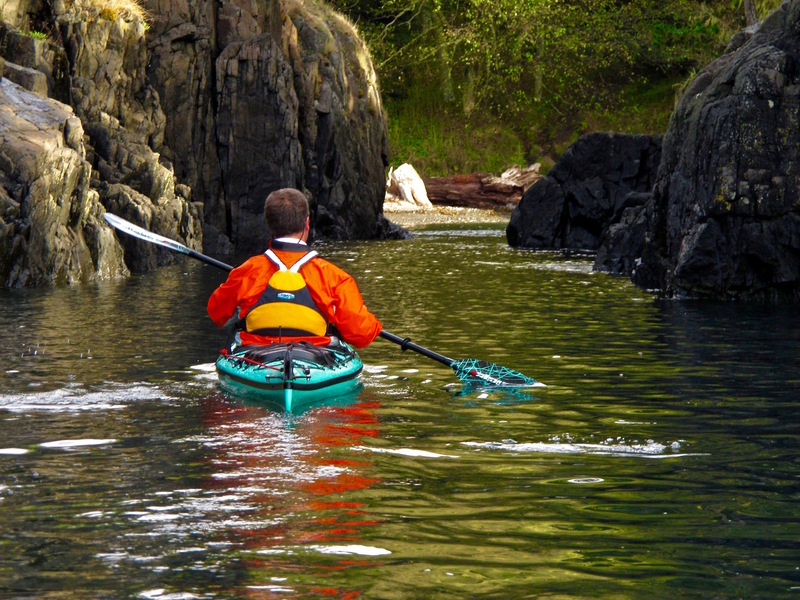 As you round the point, caution is advised as all the tidal water in the Sooke Basin flows past the tip of Whiffen Spit through a very narrow opening. Currents of up to 4 knots can be experienced here. Once around the spit continue along the shoreline on your left. You will see a few homes and small farms along here. As you begin to turn eastward you will see a point of land in the distance with The Silver Spray development on it and just beyond that is Pike Point, which is part of East Sooke Park. Just offshore from Pike point is Donaldson Island. The constriction formed between Pike Point and Donaldson can make for some very strong currents. If the flow is against you, you may be forced you to paddle out and around Donaldson Island to find some slower water. As you round Pike point you will find yourself in Iron Mine Bay. There is a steep rocky beach here that is possible to land on if conditions are ok. This will be your last chance to stop before our destination at Cabin Point. Continue out of Iron Mine Bay to the east. 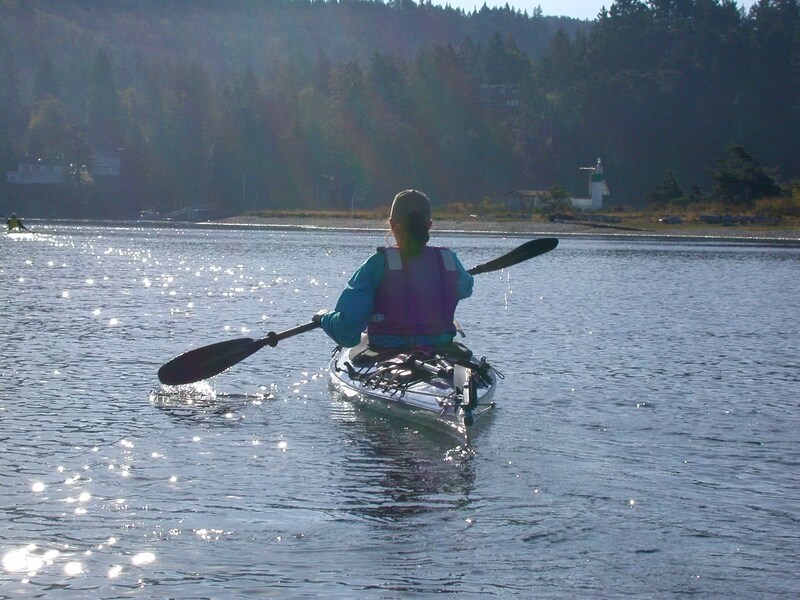 You will now be following the coastline of East Sooke Park, which is one of the largest parks in the region covering 1,400 ha (3,500 acres). 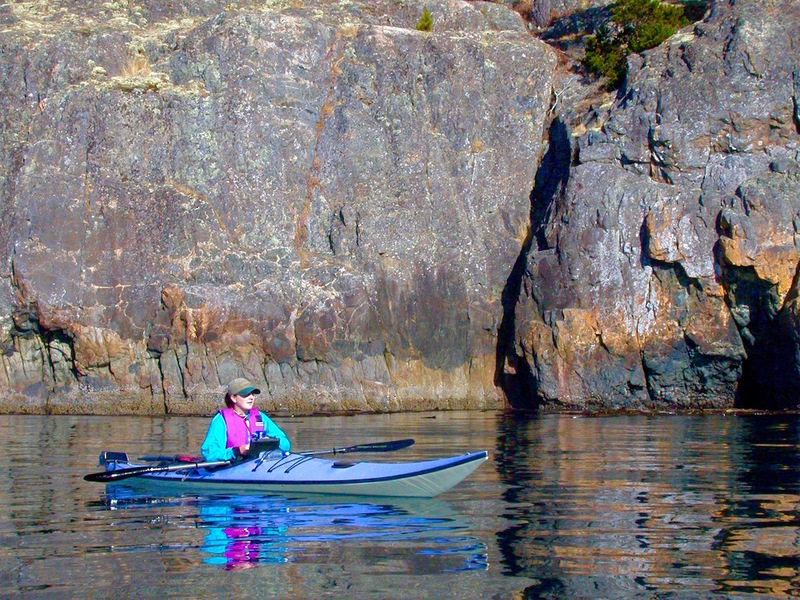 There are over 60 km (37 mi) of trails in the park, one of which parallels the coast you are paddling along. This trail runs the whole length of the park from Becher Bay to Iron Mine Bay, about a 6-7 hour hike one way. It’s length, is in part, due to the fact that you spend a lot of time hiking up and down over headlands and and in and out around rocky inlets. Just past Cabin Point is your final destination for this route. 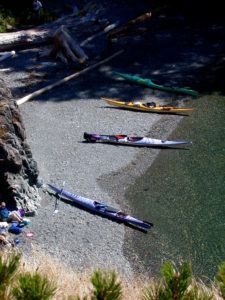 There is a beautiful little cove with a protected gravel beach and if the tides are right, you can approach the beach through a very narrow channel between Cabin Pt and an unnamed island. If the tides are too low, you will have to paddle out and around the island and approach the beach from the east side. This is a great spot to get out and have lunch before heading back. While you are here you may want to walk up the trail to your left and explore the trap shack at Cabin Pt. Trap shacks were common on this coast during the early 1900’s to house watchmen who were employed to empty the fish traps built along here. At one time as many as 15 fish traps were in operation between the Trial Islands and Boulder Beach, just west of Sheringham Light. The last traps operated during the 1958 season. Follow the same route back to Whiffen Spit. Most importantly, check the wind (speed & direction) forecast for the day at the sites posted below. Our recommendation for most paddlers is to keep the winds under 10-12 knots or 18 – 24 kph, and remember that wind against the current will create larger, steeper waves. This will bear watching in the channel between Pike Point and Donaldson Island. The closest relevant current station for the current flow you may expect around Pike Point and Donaldson Island will be Race Passage. The times will be fairly accurate, but the speed of the current will be somewhat less than that forecast for Race Passage. The current flow around the tip of Whiffen Spit is a little more difficult to predict as there are no specific table for this passage. You can’t base the flows from Race Passage because you are dealing with the filling and drainage of a large basin of water through a narrow opening. The tide tables will give you the best idea of where you are in the tide cycle and what you may expect here. 1. The easiest way to check the currents is with a very convenient iPhone app called Aye Tides. Just click ‘Find a Station’ and select Race Passage. If currents are running more than 2 knots caution should be exercised. 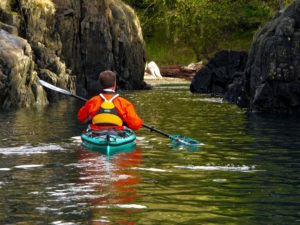 Strong eddylines (the transition between the main current and slower water near the shoreline) can easily capsize unwary paddlers. I you would like to check the tide heights for launching at Whiffen Spit, look for Sooke Basin on the App. 2. Using the Canadian Tide and Current Tables. Either use the online tables or go to page 68 of the CT&CT printed version (available at Ocean River Sports) and you will find a listing for Race Passage. The times of the turn to Ebb and Turn to Flood (essentially slack water), as well as the time of the maximum current flow are listed. The minus sign refers to the ebb or water flowing out (a westerly direction at Race) and the positive sign is the Flood or inflow (easterly). 4. 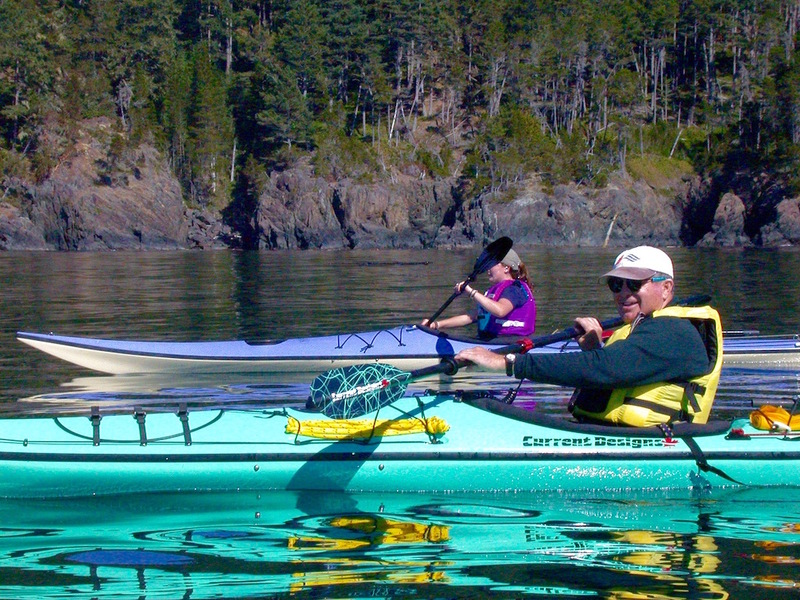 Feel free to check in with the staff at the Adventure Center either by emailing us at adventure@oceanriver.com, or phone at 250-381-4233 and we will be more than happy to help you out with your trip planning and supply you with any of the gear you may need for your adventure including boat and equipment rentals. 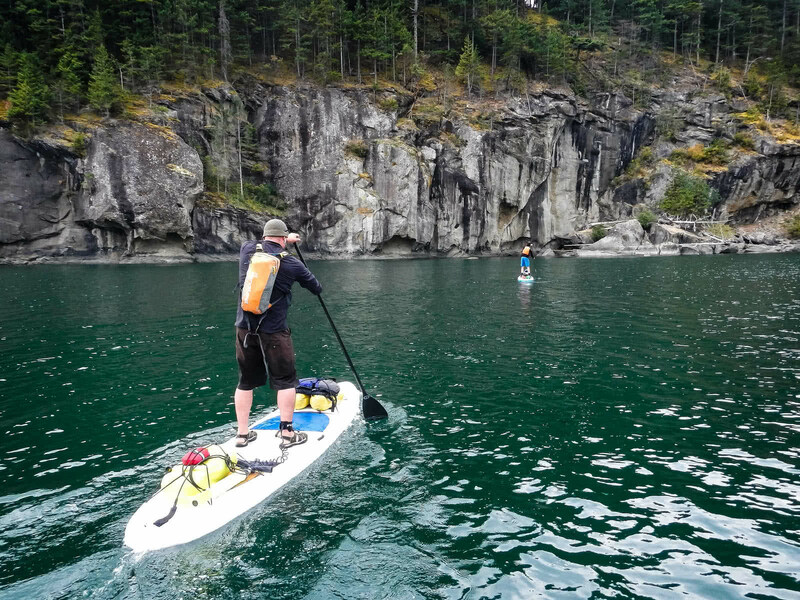 If you would like to upgrade your paddling and/or navigational skills so you can safely participate in trips like this and learn more about paddling in currents and rough water, check out our awesome kayak course curriculum. *The differences between tides and currents. Tide stations only measure the depth of the water at high and low water at a particular location. A current station, on the other hand, measures the speed and direction of the water moving past a location. Also be aware that times of high and low tide do not correspond to changes in current direction, you cannot use tide tables to predict currents, particularly around southern Vancouver Island. Fog: Fog can form at any time of year around here, but is more prevalent through the months of August and September. Sea fog here forms as a result of warmer air meeting the colder waters of the Juan De Fuca Straits. Fog can roll in quickly and completely obscure visibility. With this route you can stay close enough to follow along the shore, sea conditions pending. However, you should still be prepared with a compass and chart and/or a GPS so you can safely navigate your way back. Also, be aware that unlike radiation fog, which forms over land in calm air conditions, sea fog can be associated with high winds. Water Temperature: The waters here are cold all year round with average winter temperatures running 7.0-8.0ºC (44.5-46.5ºF) and only warming to 10-11.5ºC (50-53ºF) from May through October. In waters this cold, exhaustion can occur in 30-60 minutes or less and survival times are between 1-3 hours. 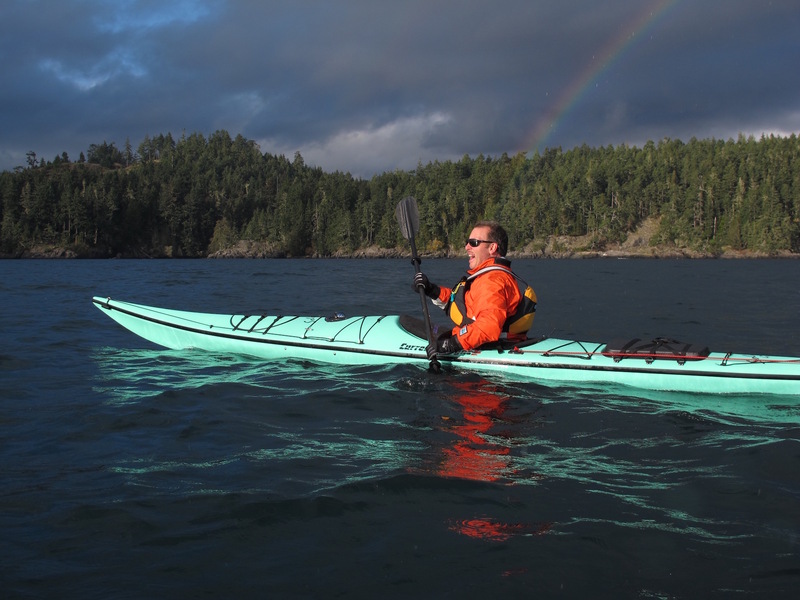 1) Have the necessary skills to paddle the rough water conditions that can be found along this section of the coast, including self and assisted rescues. 2) Do the necessary trip planning to avoid potentially hazardous conditions and keep in mind that conditions here can change rapidly, so once on the water, you need to be aware. 3) Wear the appropriate clothing, ie dress for the water temperature and the conditions. 4) Carry the necessary safety equipment. Have the necessary rescue equipment with you including signal flares and some form of communication device such as a cell phone in a water proof case (make sure you can operate it in the case and the battery is charged), a VHF radio, Personal Locator Beacon (PLB) or satellite messenger such as the Spot or inReach. They could save your life! At Ocean River Sports, we carry signal flares, waterproof cases for cell phones, VHF Radios, PLB’s and satellite messengers. Click this link to see our full review of Electronic Communication Devices. Follow Whiffen Spit Rd to parking area at the spit.